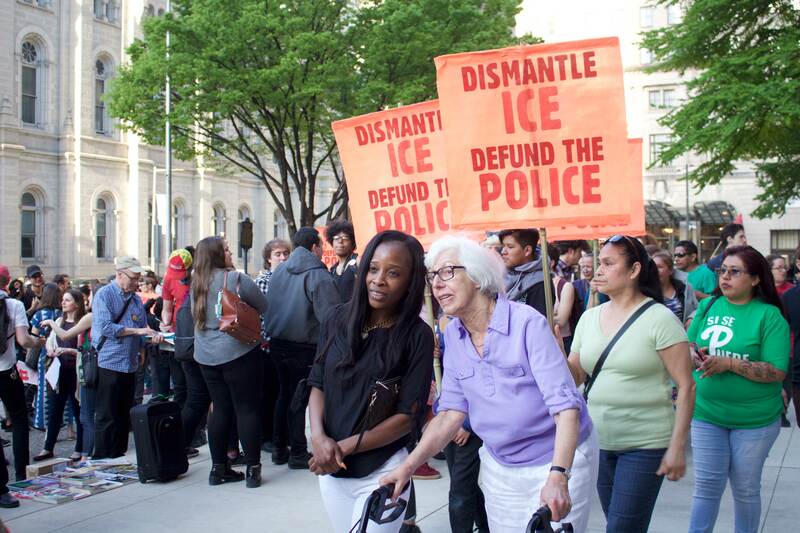 A May Day rally at Philadelphia City Hall calls for divestment from prisons, police, and ICE, and increased community and schools funding. 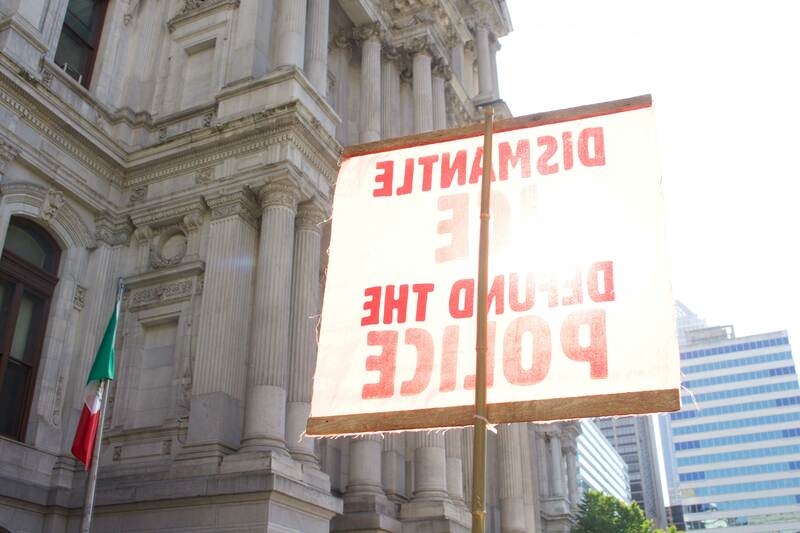 On Monday, celebrated around the world as International Workers’ Day, a coalition of local organizations held the Break the Cages, Fund the People Rally at Philadelphia City Hall to demand divestment from prison system and mass incarceration, decrease police presence in schools, and boost investment in education and community programs. 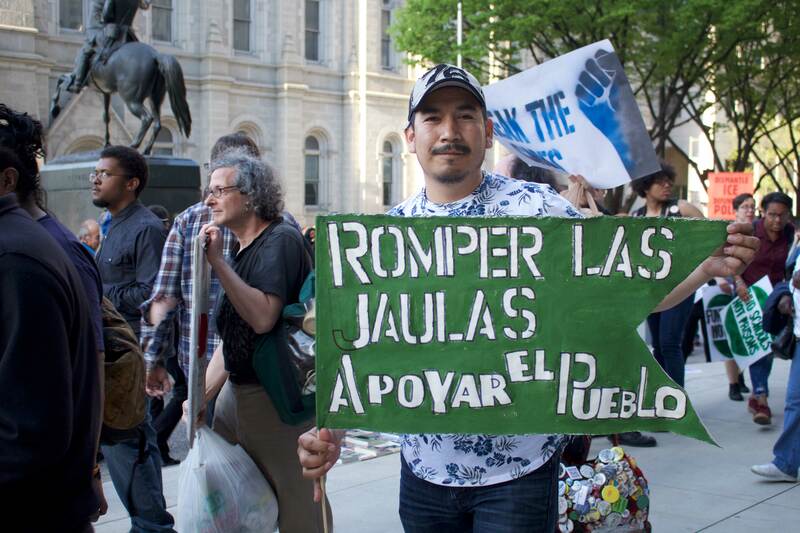 Julian Cruz was one of hundreds gathered in the late afternoon shadows, and said he decided to join the rally because of his own experience in the prison system. “I was in one of them. 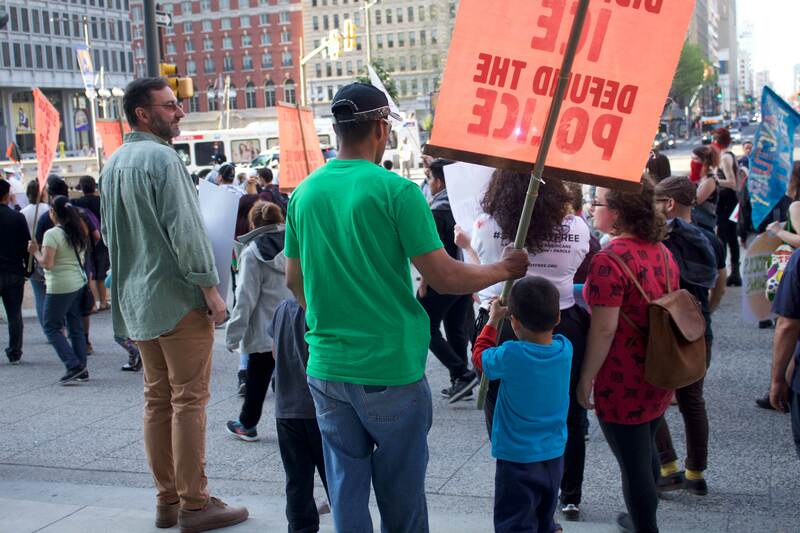 I know how inhumane it is,” said Cruz, who was walking by City Hall and stopped to listen to speakers and participate in the rally when he spotted Jondhi Harrell of the Center for Returning Citizens handing out ‘Close the Creek’ T-shirts. 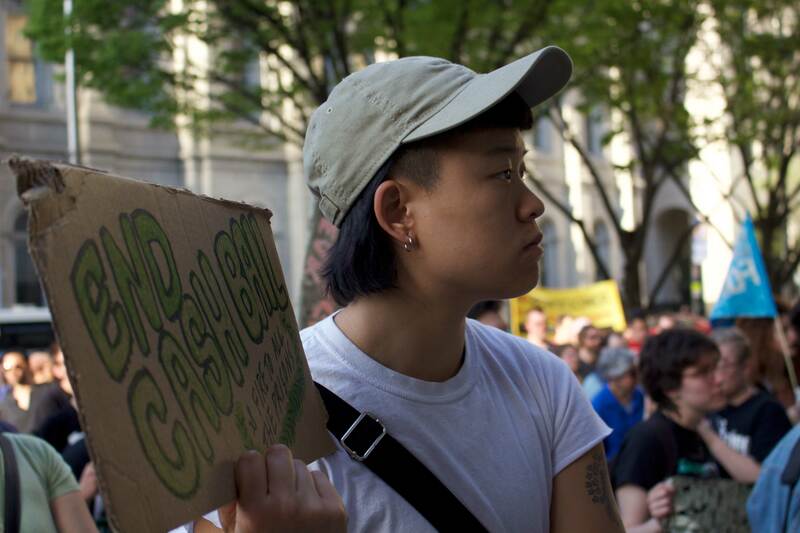 The ‘Close the Creek’ campaign refers to a call to close down the Philadelphia House of Corrections, otherwise known as ‘the Creek’ — a demand that was answered just last week, when the city announced it would shutter the 91-year-old facility by 2020. Cruz himself had spent time behind bars in the House of Corrections, and had seen and heard various instances of neglect and mistreatment, including an incident in which parts of the shower fell in on some of the inmates. Like Cruz, many of those speaking to the crowd of hundreds had a direct and personal connection to the criminal justice system. 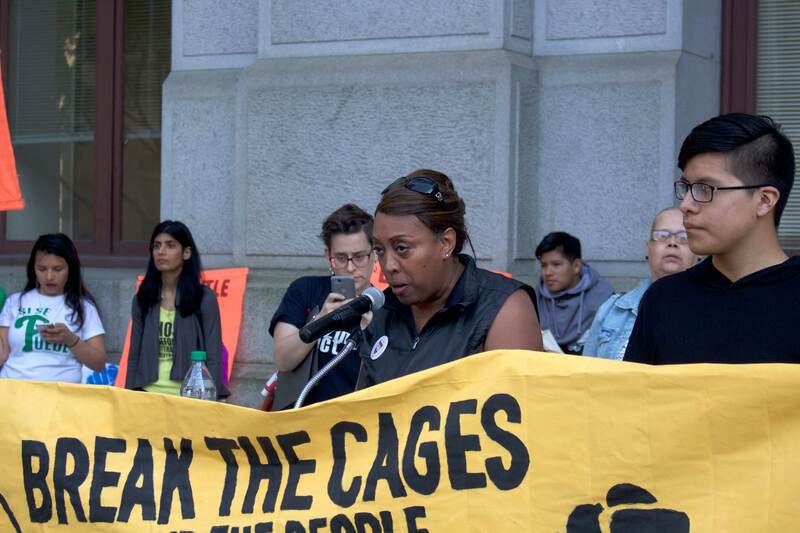 The rally was co-MC’ed by Lorraine Haw, an activist with the Coalition to Abolish Death by Incarceration (CADBI) who lost her brother to murder and whose own son is serving a ‘death by incarceration,’ or life without parole sentence. Kempis ‘Ghani’ Songster, the other co-MC, returned home after serving 30 years of a life without parole sentence he received as a young person. Speakers from “both sides” of the criminal justice system were present, including Kimberly King, whose brother, Terrell Carter, is currently serving a life sentence in prison, and joined the crowd on a phone call from behind prison bars. King and Carter also suffered the loss of two siblings to gun violence. King said that many people in Philadelphia communities have both lost loved ones to violent crime and have themselves been incarcerated or have family members and loved ones in the prison system. “We have to move out of the victim mode to a healing place” to create safer communities, King said. Other speakers included Eric Jenkins of Stadium Stompers, who is leading an effort to end to stadium development plans in North Philadelphia, and Julien Terrell, executive director of the Philadelphia Student Union, who outlined the many ways schools must stop criminalizing students. 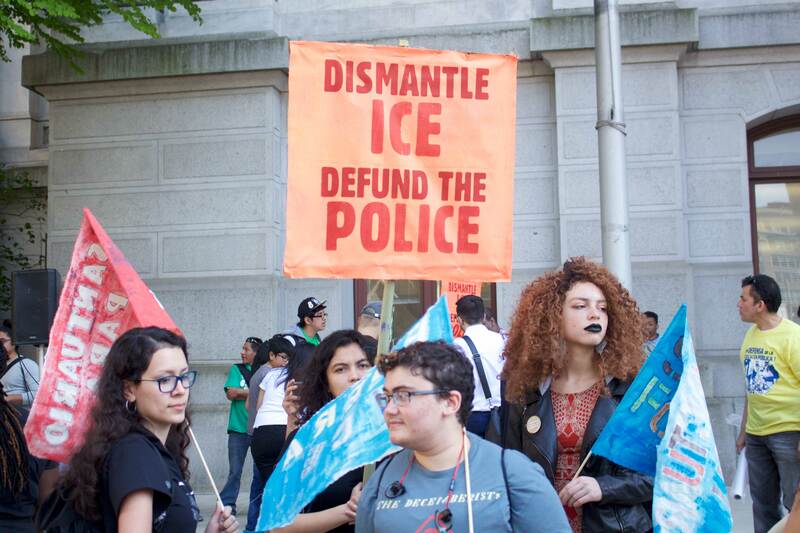 Herlinda Hernandez and Marissa Piña of immigrant advocacy organization Juntos called on the city to refuse to renew a contract with ICE which allows the immigration enforcement agency access to the city’s Preliminary Arraignment Reporting System, or PARS. PARS contains real-time information on all police arrests in the city. 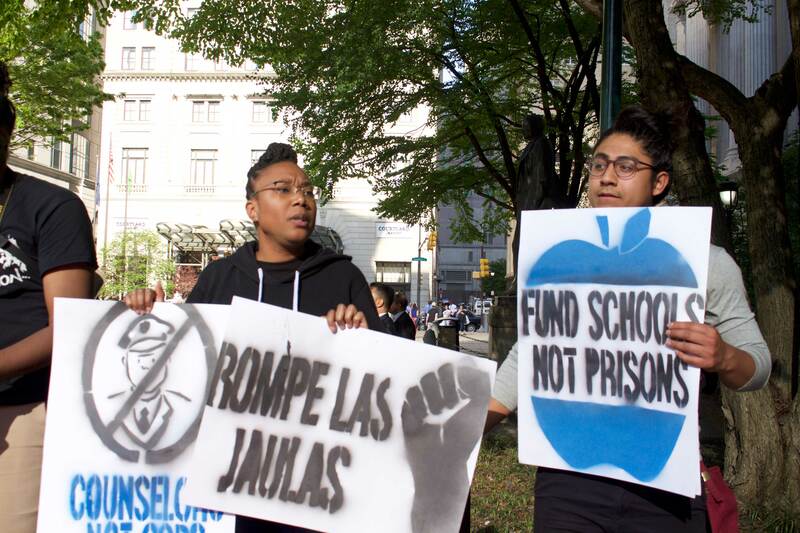 “Today we’re demanding that the city of Philadelphia end the criminalization of our communities and instead invest in our futures,” said Juntos members Herlinda Hernandez and Marissa Pinna in a joint, bilingual statement to the crowd. 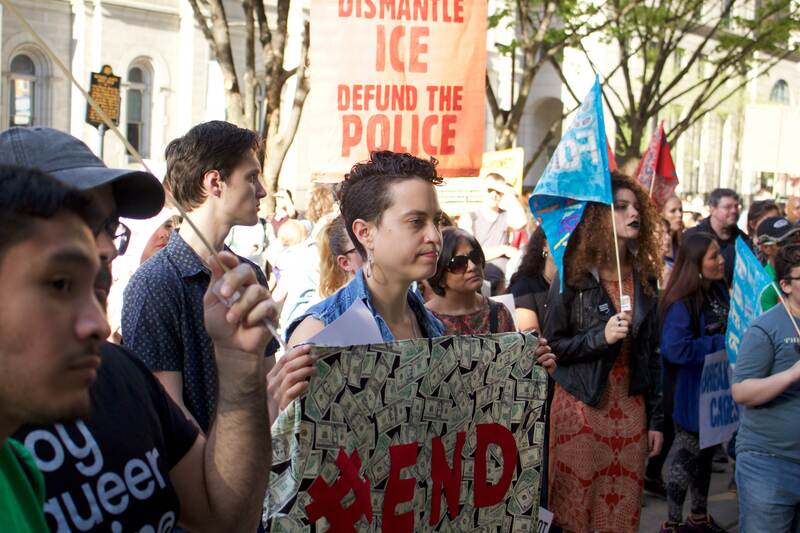 Both Juntos members called for the city to decline to renew the contract with ICE granting access to PARS when it is due to expire on Aug. 31. 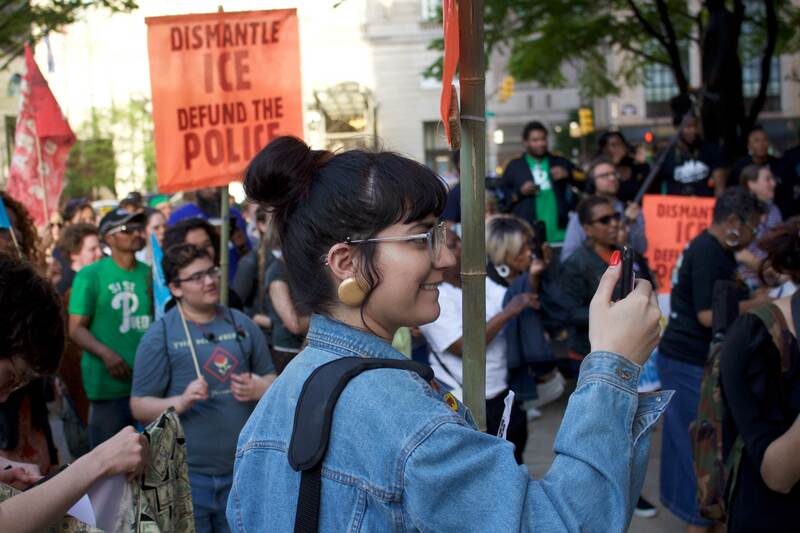 Many of the hundreds of people in the crowd had brought homemade signs highlighting the issues they were most passionate, including ending cash bail, stopping ICE, and defunding prisons. 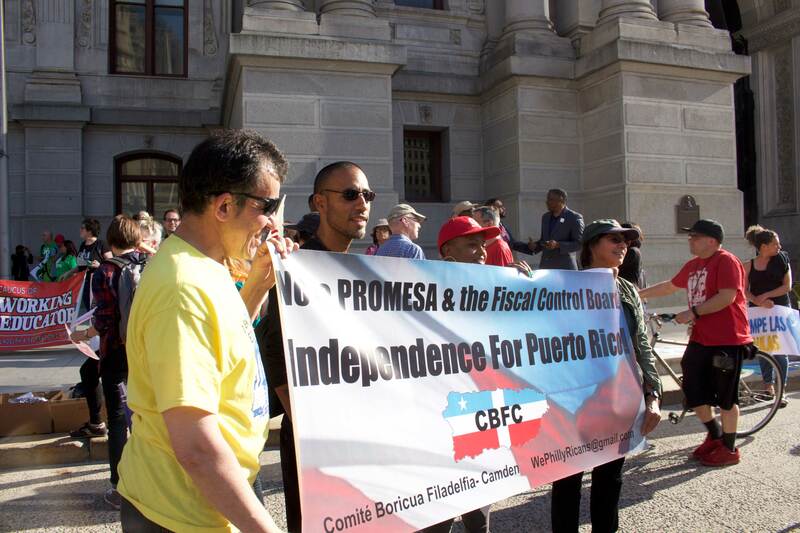 “We’re in solidarity with workers and immigrants,” said Fermín Morales of the Comité Boricua Filadelfia-Camden, explaining that the economic oppression and other issues Puerto Ricans face interest with the challenges local immigrant and working communities must confront. Some in the crowd echoed the demand for greater equity in funding, stating a simple request. “We want the money to go to the communities instead of prisons,” said Jenna McElroy, present at the rally with the ACLU of Pennsylvania. 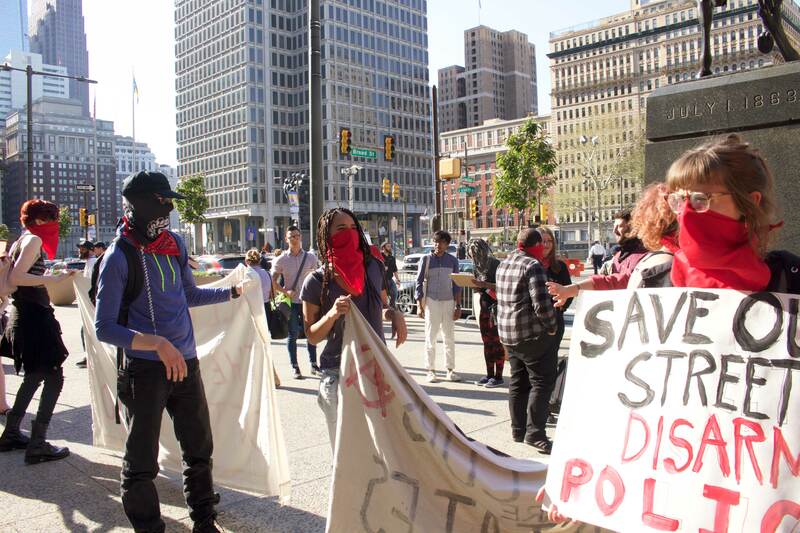 The coalition said it will present a petition to the City Council and the city with a list of demands for the 'People's Budget,' as the City Council is currently debating fund allocation for the 2019 budget.